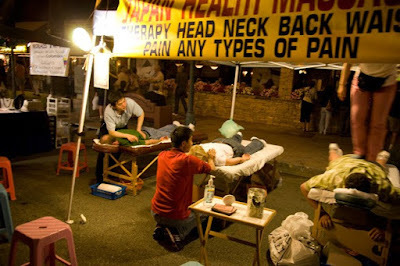 Business is brisk at the massage booth at the street fair last Thursday night. This is the owner of Aspen Mills Bakery, a great place to get fresh bread in Palm Springs. 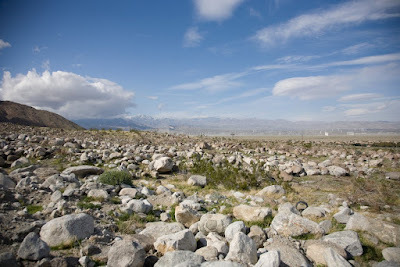 The desert looking northwest from Palm Springs. It's been a long time since this flaming piano virtuoso has died, over 2 decades. Gee, how time flies. 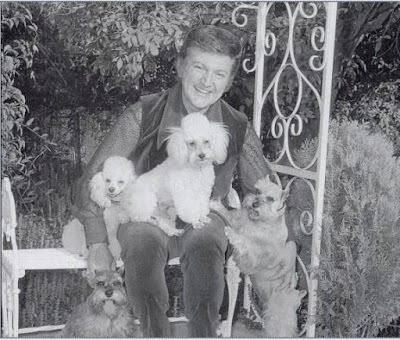 Liberace had a home in Palm Springs. 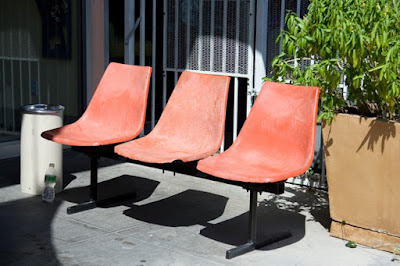 Are these three chairs still somewhere on Arenas? They're relics. This is no easy roof to build. Zig zag roofs are my favorite. 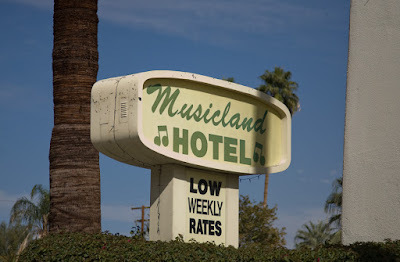 One of my favorite Palm Springs signs. She was often called Legs Miller and you can see why in this photograph. 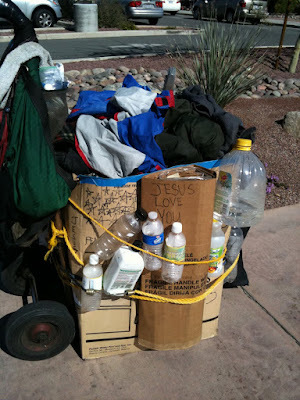 She lived in Old Las Palmas. How's shopping carts for art? Add a little text about meat and I've got yourself an art party. Got a light? That's the question asked at the recycling center. 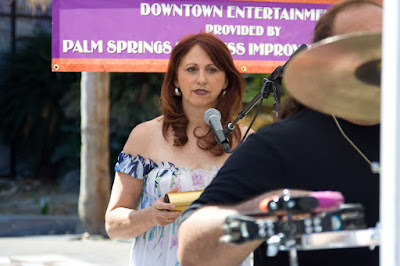 Last year there used to be a band that played in downtown Palm Springs on weekends. Anyone know if it's still there this year? 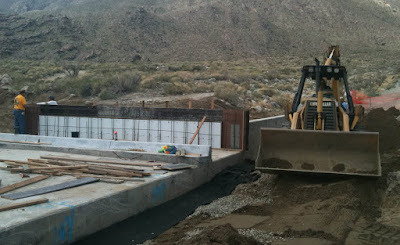 The work never seems to stop on South Palm Canyon near Murry Canyon Drive. It seems as though the construction workers have been working in that wash forever. What in the heck are they doing? 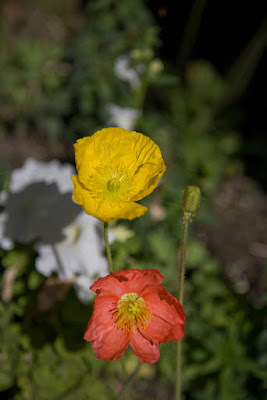 Here are some flowers for ya. 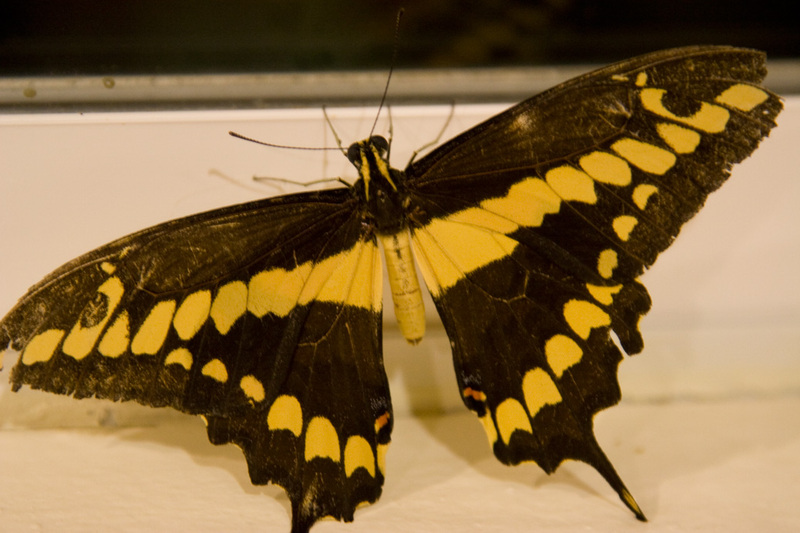 They're not wild, but they're beautiful! You have to love this house. 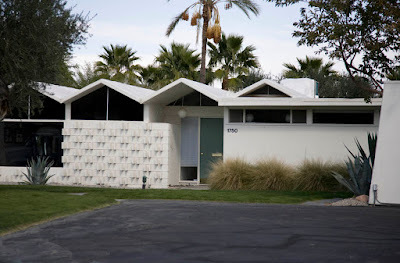 It's the Kaufman House in Palm Springs. Richard Neutra designed it. The house, which was built in 1948, has gone through many renovations. If it were to be sold today, the cost would be well over 10 million. 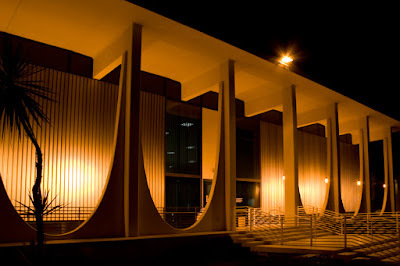 It's one of the most important mid-century modern landmarks in the world, and I ride my bike by it every day. You gotta just love a business that replaces a light fixture with a disco ball. I love the night life, I gotta boogie on the disco-round. Palm Springs is a great place to see old Mustangs. 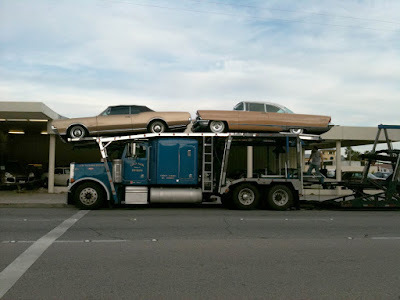 Semi that was filled with antique cars in front of Mccormick's Exotic Car Auctions. Two cars remained by the time I got the shot. 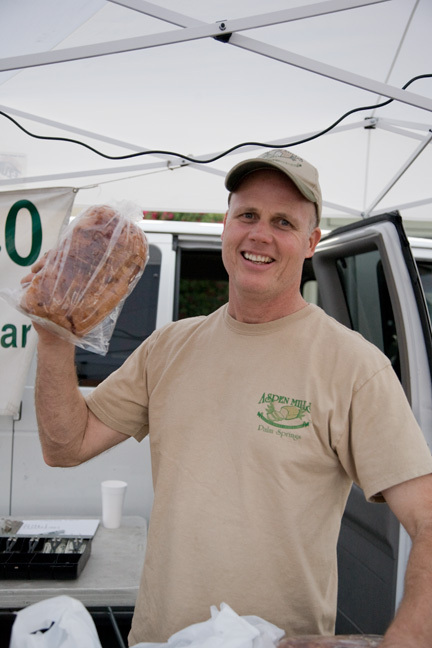 Palm Springs is in the midst of a grocery store war. The competition among all the new stores that have sprung up is fierce. 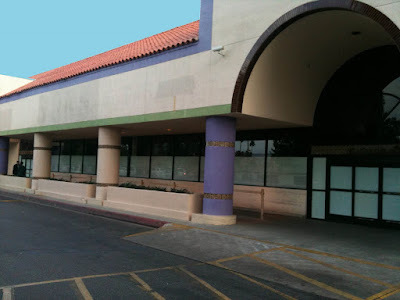 The battle to keep the Vons open in Palm Springs Mall has been lost. 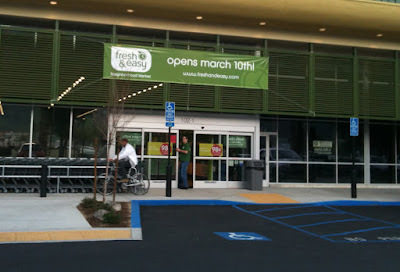 It closed just as the Fresh and Easy is about to open a block away. Finally. 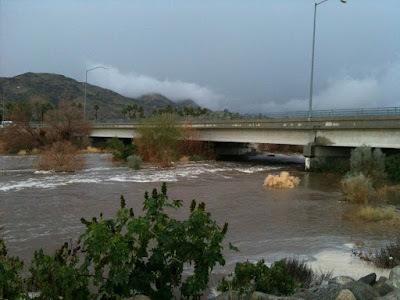 It's been sitting there (at Sunrise and Tahquitz Canyon) empty for months! 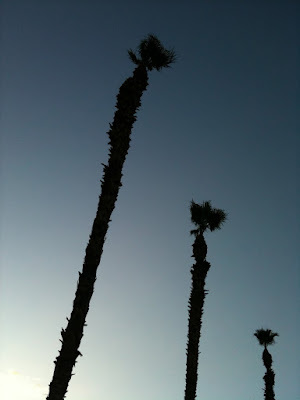 Trimmed palm trees as seen from the corner of Sunrise and South Palm Canyon. 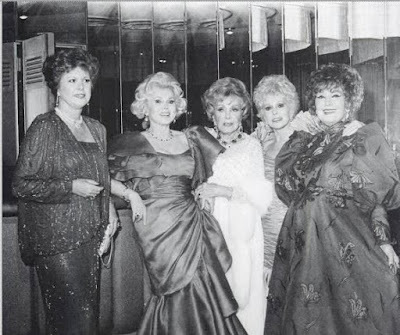 This is an picture of a picture of the Gabor sisters--some really campy Gaborabilia . 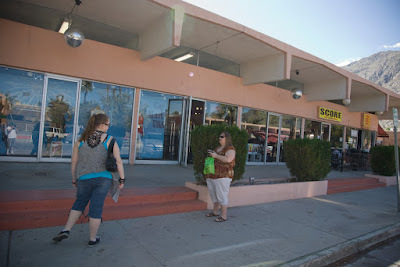 Complements of the Palm Springs Historical Society. Magda lived in Palm Springs and died in the 1990s. Eva died in the 1990s too. She was the one on Green Acres. 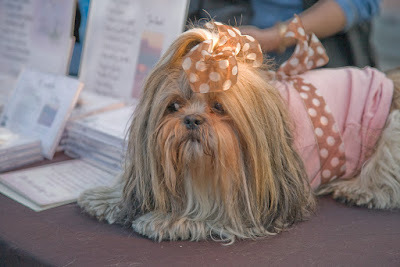 Zsa Zsa is still alive. I believe she's 93. 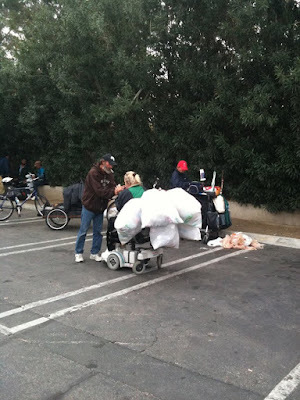 She's the great aunt of Paris Hilton. If anyone can fill in the blanks about these women, please do. Daytime on Arenas in Palm Springs. Like how the white of the clean laundry pops out in this picture. Went to a couple of open houses this past weekend. 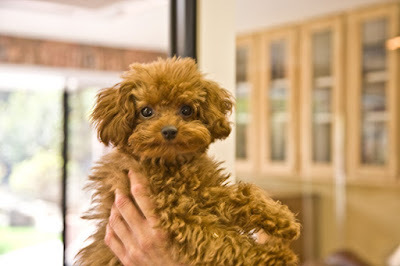 In one of them, I ran into some poodle puppies. 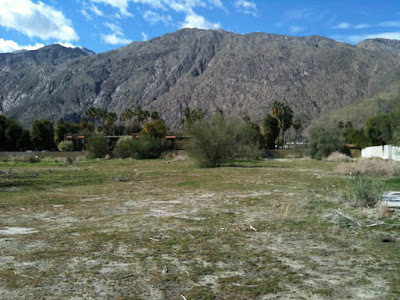 What better place could there be to raise poodles than Palm Springs? 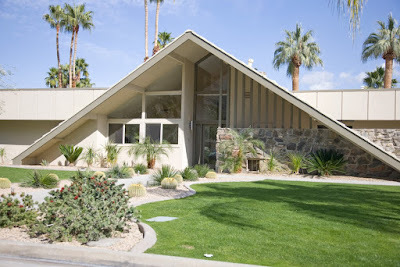 Here's a great Swiss Miss house in the Las Palmas neighborhood of Palm Springs. 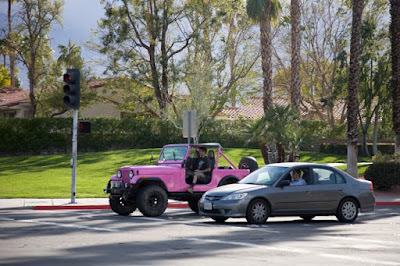 A pink jeep was spotted at El Cielo and Ramon Road this afternoon. Check it out. Only in Palm Springs. 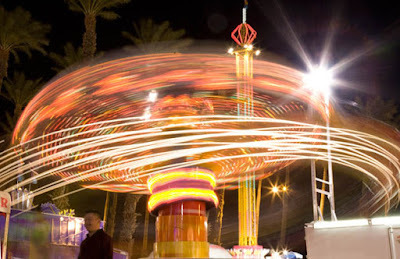 Doesn't this shot make you want to go on the rides? 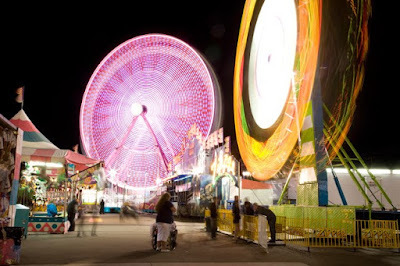 If you go to the fair, you'll find that all of the people who work there are really nice. That makes for a pleasant experience. The date fest ends this weekend. This is one of the many rides there. I caught it using a slow shutter speed on my camera. And, of course, I used tripod. 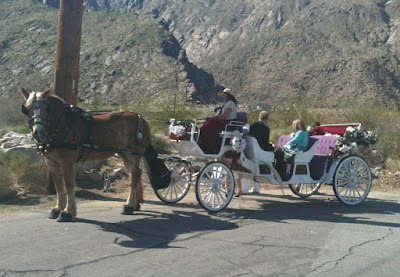 These usually run up and down Palm Canyon at night. Caught this one against the mountain. 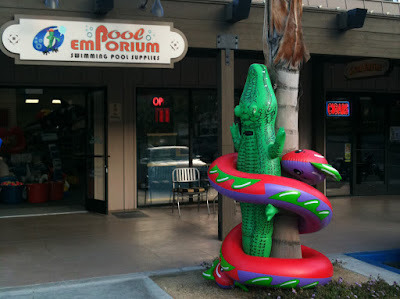 What would Palm Springs be without a pool store? 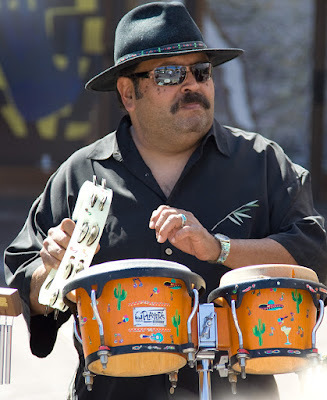 Music's all around on the weekends in Palm Springs. Gotta love those golfers. This is a course just off Ramon Road. The temperature hit 80 here. The grass is blinding green from the recent rains, and those golfers are just lovin' it. Is this an old picture? 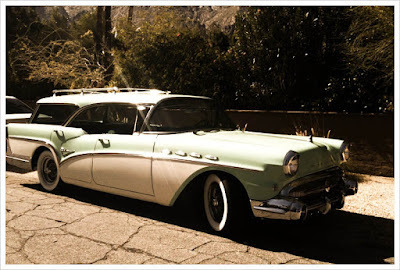 Nope, it's a picture of a Cadillac station wagon that was taken yesterday in Palm Springs. The picture was taken with an iPhone. It was tweaked using the magazine option in the Camera Bag app. 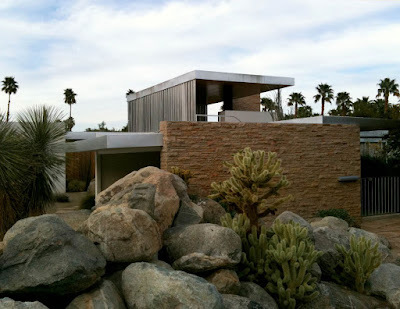 Here in Palm Springs we have the one of the biggest collections of modern architecture in the world. Take the building in this shot. Look at the curves and lines; the concrete, the glass. 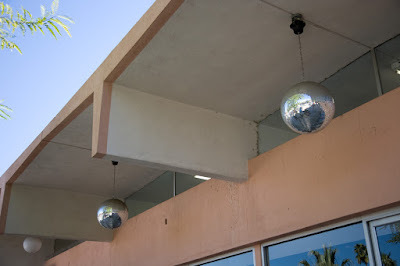 It's all modern this week as Modernism Week celebrates 5 years of showing the planet how the future looked in the past. Now that the rains have gone, everyone's ready for President's Day weekend, which will flood Palm Springs with hot guys, but not as many hot guys that will be here for the White Party, which is in April. 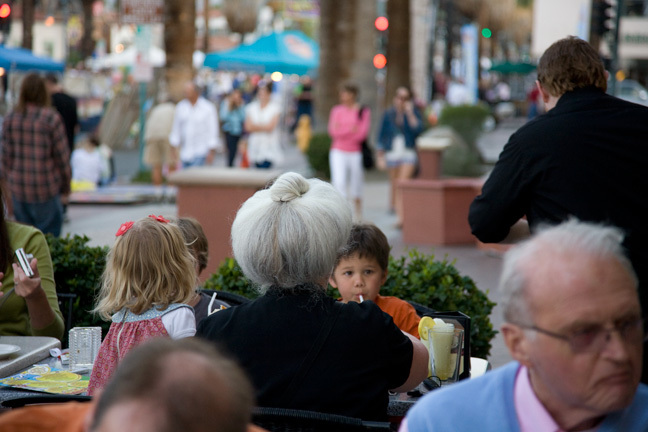 Palm Springs has a diverse population. Nearly 40 percent of the people that live here are gay. I've never marketed my books to hot guys, but now is as good a time as any. Come on guys pull out your cameras to not only photograph each other, but also to capture the cool desert scenery around here. Learn how to make those photographs winners with 101 Quick and Easy Secrets to Create Winning Photographs, a book written by a Palm Springs photographer. Check out my other books too: 101 Quick and Easy Secrets for Using Your Digital Photographs, 101 Quick and Easy Secrets Taken from the Master Photographers of the 20th Century and 50 Greatest Photo Ops in San Francisco. 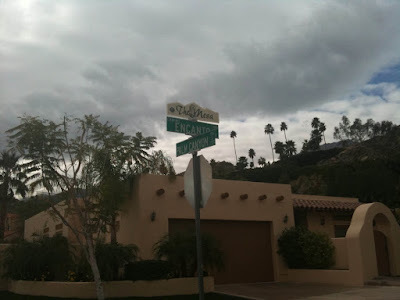 Check out the fancy addition to the street sign in the Mesa neighborhood of Palm Springs. Each street sign in the neighborhood has a an added sign that says "The Mesa." Just in case if you didn't know where The Mesa neighborhood was, it's around South Palm Canyon in the southern edge of the city. You just gotta wonder how much the extra signs cost and who paid for 'em. By the way, Mary Tyler Moore once lived there. 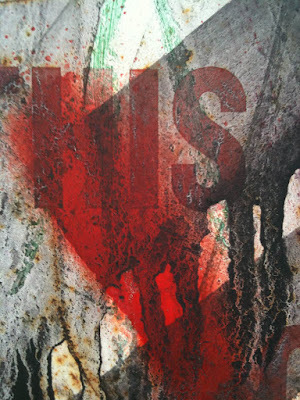 Here's an abstract photograph of graffiti on a sign taken in Dumuth Park in Palm Springs. 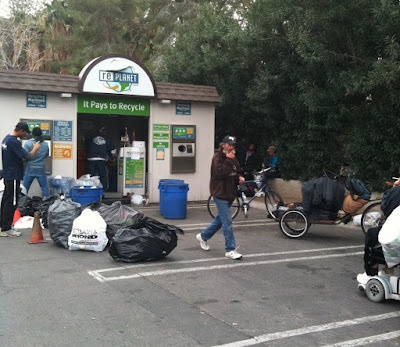 This is a busy day at the Palm Springs recycling center. 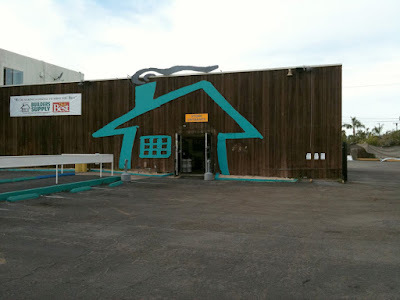 This is the place for the homeless to hangout. If they're not here, they're nearby. The recycling center is behind the Ralph's on Highway 111. I got "caught" taking this picture by a homeless guy. He looked too messed up to do anything, but if they're were fewer people around, who knows what he could have done. At any rate, this is a busy place. 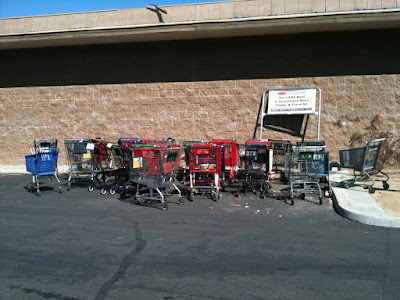 There's lots of music usually blaring from a radio and numerous shopping carts dot the landscape. 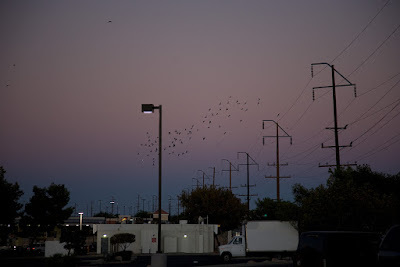 Birds flying over the high desert. Mountain Greenery Status Update: The mountains are starting to turn green. I'll update in another week or two as the color change increases. 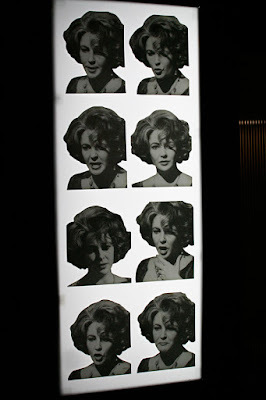 When I was busy photographing events in Palm Springs, I came across the lightbox montage of Elizabeth Taylor in a client's home. First thing that comes to mind when thinking of Taylor is finding a quote by her. 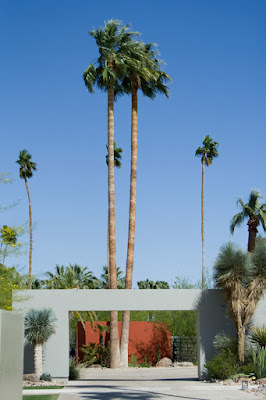 Elizabeth Taylor used to live in a Palm Springs "A" frame house in Old Las Palmas. Two weeks ago, it looked as if it would never had stopped raining. Today the clouds gather once again. But will it rain? We'll just have to see. 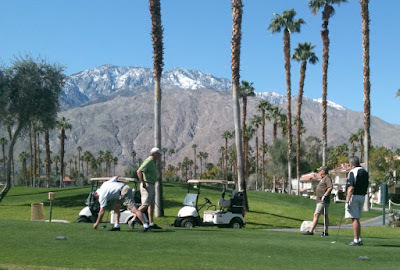 Picture is golf course just outside Dumuth Park in Palm Springs. Hey the Palm Springs guy is back. Here's the entrance to a house in Las Palmas.